From the author of Somebody Like You, a RITA finalist, and one of Publishers Weekly’s top ten books of 2014, comes the story of a woman who has everything for a perfect wedding—except the groom! Winning an all-expenses paid Colorado destination wedding might seem like a dream come true for some people—but Caron Hollister and her boyfriend Alex Madison aren’t even engaged. How is she supposed to tell him she’s won their wedding and honeymoon when he hasn’t asked her to marry him? Being “perfect for one another” seems like the absolute best reason to get married. But what if their supposedly faultless relationship is merely a safe place to protect his secrets and a way to keep their families happy? After quitting her job, Caron accepts her best friend’s offer to visit Colorado. She needs to catch her breath. Who knows, maybe visiting the destination wedding site will make a future with Alex seem like a reality. Kade Webster just landed the biggest deal of his life with his company, Webster Select Realty, participating in the Colorado Springs Tour of Homes. He never imagined he would run into the woman who broke his heart—Caron Hollister—right when his career is taking off. Seeing her again, Kade can’t help but wonder why Caron walked away from him years ago, leaving him with no explanation. When Kade learns his home stager won’t be able to help with the Tour of Homes, he vaults past all the reasons he should stay away from Caron, and offers her a temporary job helping him on the project. This time, their relationship is purely business. Spending time with Kade has Caron questioning everything. The man intrigues her—at times infuriates her—and reminds her of what she lost. Has she been settling for what everyone expects of her? Just because others believe she and Alex are an ideal couple, does that mean they should get married? And how can Caron say “I do” to one man when she’s wondering “what if?” about another? Beth K. Vogt is a nonfiction writer who said shed never write fiction. After saying shed never marry a doctor or anyone in the military, she is now happily married to a former Air Force family physician. Beth believes Gods best is often behind the door marked "never." An established magazine writer and editor, she now writes inspirational contemporary romance because she believes there is more to happily ever after than the fairy tales tell us. "Vogt's second Destination Wedding novel has everything readers want in a romance." "I love Vogt's layered and masterful romances. Almost Like Being in Love was one of those stories you don’t want to end, and I lingered over every page enjoying the intriguing characters. Highly recommended!" 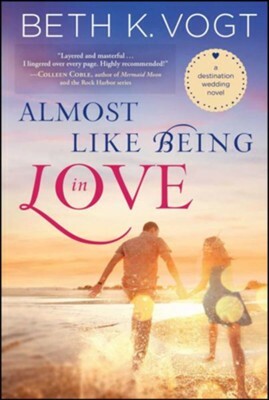 "Almost Like Being in Love is the perfect beach read. 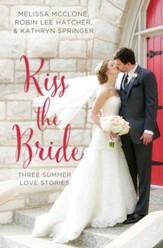 Beth K. Vogt delivers a charming romance with a sigh-worthy Happily Ever After ending." 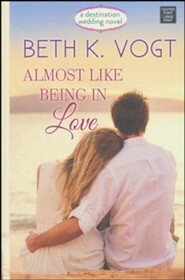 "In Almost Like Being in Love, Beth Vogt once again introduces us to relatable, heart-tugging characters. Caron and Kade are struggling with broken dreams, both their careers and their love lives in upheaval. I loved the thread of hope laced through this story and the reminder that sometimes the best things in life are waiting for us behind the most unexpected doors. Another keeper for your bookshelf!" "It's always a pleasure to read a Beth K. Vogt book. Authentic characters with realistic struggles we can all identify with bring her well-written words to life in this touching story about finding love where you least expect it and finding the courage to follow your heart. Almost Like Being In Love is another winner that fans and new readers alike will thoroughly enjoy." "Love is complicated. Family relationships are complicated. In Almost Like Being in Love, Beth K. Vogt explores the collision of the two with a soft touch and deft hand. Her novel sings with grace and the journey to learn who we are and how to stand on our own. And how to do that while risking all to discover who we are and a love that will sustain us. A beautiful novel that I inhaled." "Author Beth Vogt has done it again—a story you can curl up with and crawl into. Her characters are so real, I wish we could hang out. She has a permanent place on my favorite’s shelf." "Beth K. Vogt does it again! Almost Like Being In Love is a sweet, second-chance-at-love story that will have romance fans swooning, but it's in the women's fiction elements that Vogt truly shines. Her exploration of how living up to others' well-meaning expectations can divert us from God's plan is especially resonant. Another entertaining and thoughtful entry from one of my favorite contemporary storytellers. You won't want to miss this one!" I'm the author/artist and I want to review Almost Like Being in Love: A Destination Wedding Novel - eBook.